Modern companies are trying by all means to collect more information on the number of users, and therefore this investment data for different purposes, for example, ads or sell this information to other companies. Of course not all users are satisfied that the data about their behavior and their personal information private servers on these companies is stored. 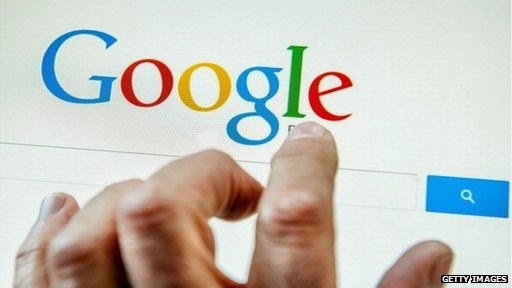 Fortunately, some companies, led by Google, which enables you to access to information and data that you know when you use a Google search or other services across a range of engine links set by Google at your fingertips, you can also remove some of the data from which.
. These data are used to display information relevant to these ads. To see them, click on this link. 2. 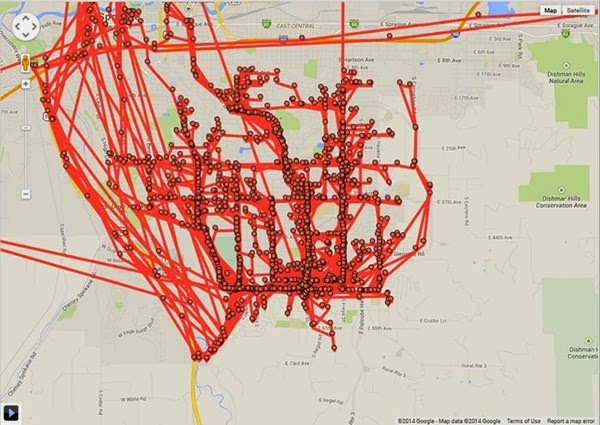 Google is spying on all your movements. If you are available on a smartphone or tablet device running Android, make sure that Google keeps track of all your movements and even know the dates of your travels and tours. If you do not believe me, you can see this link. You can download all of these dates as well. You can Alasfadh of this service in the case of the theft of your smart phone (in this case if the phone is still linked to your account on Google). 3. 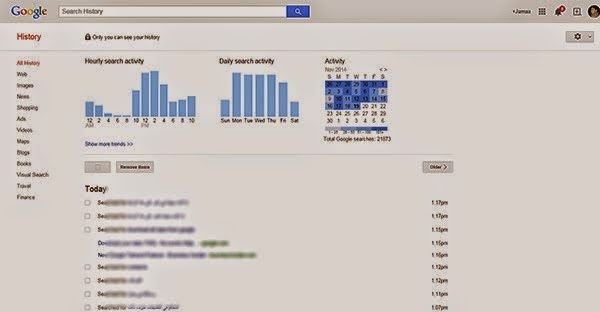 Google retains all know and what you are looking for in the internet! 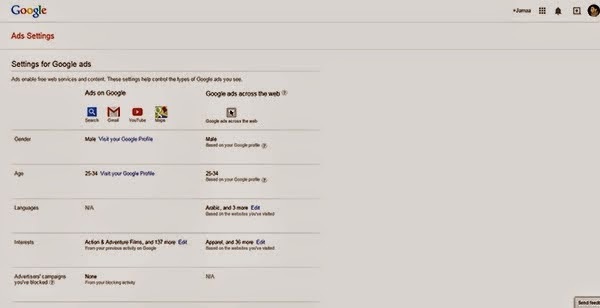 Google is also stores everything you're looking for on the Internet through the Google search engine, this information is used to display nearby announcements of what you're looking for, so do not be surprised if they found a declaration of the content is similar to what you're looking for access to record your search. You can with the possibility to delete this according to a certain period of time records (based on search history), or manually delete the records, in addition to this feature sorted by category and type (search through words, pictures, etc.). 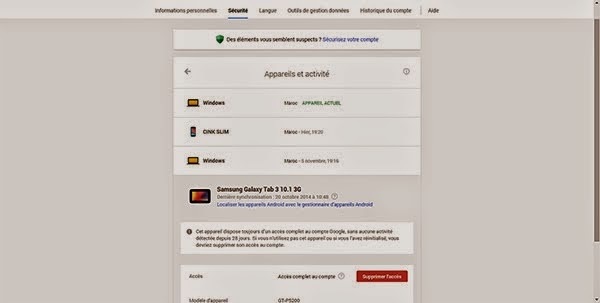 Through this link is very useful, you can see a summary of all the connected devices to your account and place and dates of contact with .walohm so that you can stop the arrival of any of your device on Google. These are very important feature in the case of used your device did you delete it. 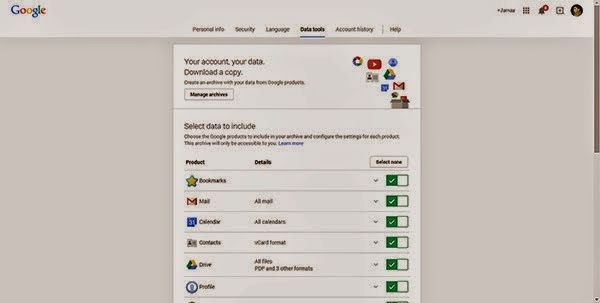 Another step in the field of protection and secure your account, Google also put a link between your hands to check and see all the applications and locations where your Tsaml on Google to log it. From this page you can cancel these applications permissions and sites.